World Superbike champion Jonathan Rea and team-mate Tom Sykes unveiled the 2017 Kawasaki Ninja ZX-10RR during a special launch event in Barcelona. Jonathan Rea has pulled the wraps off the factory Kawasaki he hopes will fire him to an unprecedented third straight World Superbike crown this year. The Ulster rider and team-mate Tom Sykes unveiled the 2017 Kawasaki Racing Team livery in front of a packed gathering in Barcelona on Thursday night. It was the first time Rea’s new Ninja ZX-10RR had been showcased in its official colours, sporting the logos of major team partners Motocard, Elf Total and Monster Energy on the striking ‘green meanie’. Rea, who retained the Joey Dunlop trophy at the Cornmarket Motorbike Awards in Belfast in January after being named the Irish Motorcyclist of the Year for the second season running, has excelled in pre-season testing, topping the times in each test held at Jerez in Spain to throw down the gauntlet to his championship rivals. The 30-year-old became the first rider since World Superbike great Carl Fogarty in 1999 to seal back-to-back crowns following another commanding performance in 2016, but Rea now has his sights set on making history as he prepares to stake his claim for a record hat-trick of consecutive titles. 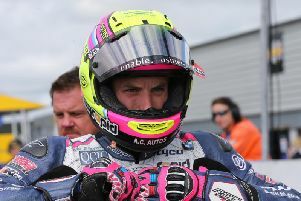 The Ballyclare man will soon head to Australia for the opening round at Phillip Island (February 24-26) and Rea is eager to commence the defence of his world crown at the spectacular circuit near Melbourne. “It is really nice that every year KRT really pull out all the stops for our team launch. The last few years it has been in beautiful iconic spots in Barcelona and again this year we are in this really cool cinema, pretty much in the heart of the city,” he said. A final pre-season test will take place at Phillip Island from February 20-21, only a few days before the action commences in earnest. Along with Yorkshireman Sykes, Rea’s opposition this year includes compatriot Eugene Laverty, who returns to the class on the Milwaukee Aprilia under the Shaun Muir Racing umbrella after two seasons in MotoGP. The new-look Red Bull Honda squad includes Nicky Hayden plus new signing and ex-MotoGP rider Stefan Bradl on the much-vaunted Fireblade SP2, while Marco Melandri – also a former GP contender in the premier class – has teamed up with Welshman Chaz Davies in the Aruba.it Ducati colours.